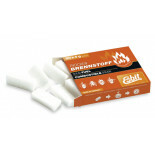 The success story of the brand Esbit® began in 1936 when the solid fuel tablets were invented by Erich Schumm. 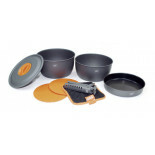 Soon after further products like for example the stoves in pocket format were launched. 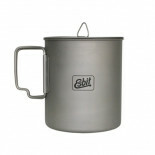 Esbit Compagnie GmbH was founded in Hamburg / Germany in 1949. Fritz Paap was member of the board for more than three decades. In 1982 his son Dieter Paap was appointed Managing Director of the company. Nowadays the family business is being managed by Philip and Robert Paap in third generation. Like this traditional values of the brand and the company will also in the future be of great importance. 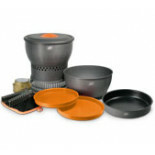 Hard anodised aluminium kookset met spiritus brander. Set bestaat uit pannen (1,8 en 2,4 l), skillet, warmtewisselaar, greep, borden, pannenlap en foudraal. 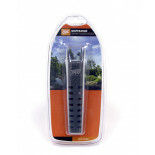 Afmetingen: 12.8 x 20.2 cm. Gewicht: 1.050 kg. Verpakking met 6 tabletten in doordrukstrip (waterdicht verpakt). 1 tablet brengt 0.5 l water in 7 minuten aan de kook. Ook handig als fire starter. 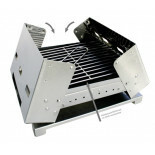 Compact inklapbare rvs grill c.q. BBQ. Grilloppervlak: 29 x 22 cm. 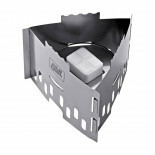 Meest compacte tabletbrander van Esbit. Verpakking met 12 tabletten in doordrukstrip (waterdicht verpakt). 1 tablet brengt 0.5 l water in 7 minuten aan de kook. Ook handig als fire starter. Verpakking met 20 tabletten in doordrukstrip (waterdicht verpakt). 2 tabletten brengen 0.25 l water in 5 minuten aan de kook. 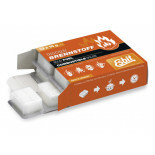 Ook handig als fire starter. Stevige pannengreep. 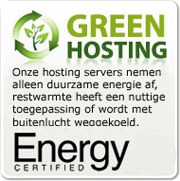 Past op de verschillende pannensets. 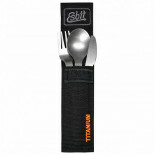 Esbit Titanium cutlery, 3 pcs. 3-delig titanium bestek. Inclusief foudraal.